The FCC is no longer a champion of net neutrality regulations. 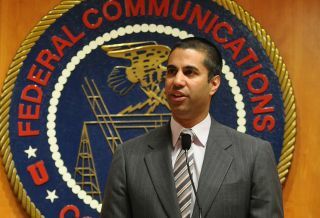 Under the Obama administration, the Federal Communications Commission was ultimately able to implement net neutrality rules to ensure an even playing field. Those rules are now in jeopardy as new blood takes control of the FCC. The agency's chairman, Ajit Pai, has long been opposed to treating Internet service as a utility, and lest anyone thought he may have changed his mind since replacing Tom Wheeler, he stated today at Mobile World Congress that net neutrality was "a mistake." In his prepared remarks, Pai seemed to be reaching out to telecoms by indicating the FCC's torch has been passed, and that the ones who now hold it are very much in favor of "light-touch" regulation. "It's evident the rules were a mistake," Pai said in reference to the FCC's utility-style regulations on broadband Internet, according to CNET. "It created uncertainty in the market, and uncertainty is the enemy of growth." Pai indicated he would preserve a free and open Internet, but argued that existing net neutrality rules have lessened the level of broadband investment that would have otherwise occurred. "Remember, networks don't have to be built," Pai added. "The more difficult the government makes it to deploy investment, the less likely that broadband providers will take the risk." In other words, Pai believes broadband providers were doing great before net neutrality rules came in and screwed everything up. One could certainly argue that point—and Pai does, vaguely—but at what expense? The kerfuffle between Comcast and Netflix should serve as a reminder of what can happen when broadband providers and services find themselves at odds with one another. Comcast throttled Netflix's traffic because it wanted the streaming video service to pay a higher fee for the bandwidth it was consuming. Comcast subscribers were caught in the crossfire of this dispute until Netflix caved. The notion that broadband providers will self-regulate themselves in the best interest of consumers is highly suspect. It also shouldn't be taken at face value that net neutrality rules caused broadband providers to invest less in their growth and infrastructures. The claim doesn't align with the findings of The Consumerist. Pai's remarks come two weeks after FCC commissioner Michael O'Rielly referred to ultra-fast broadband (1Gbps service) as a "novelty" for consumers who already have access. "The outcry for things like ultra high-speed service in certain areas means longer waits for those who have no access or still rely on dial-up service, as providers rush to serve the denser and more profitable areas that seek upgrades to this level," O’Rielly said, according to Fierce Telecom. "Today, ultra-fast residential service is a novelty and good for marketing, but the tiny percentage of people using it cannot drive our policy decisions." Looking ahead, it is expected that Pai will dismantle existing net neutrality rules. To some extent he's already begun the process—earlier this month, the FCC stopped its practice of investigating 'zero-rating' services. His comments today suggest that more policy reversals are on the way.